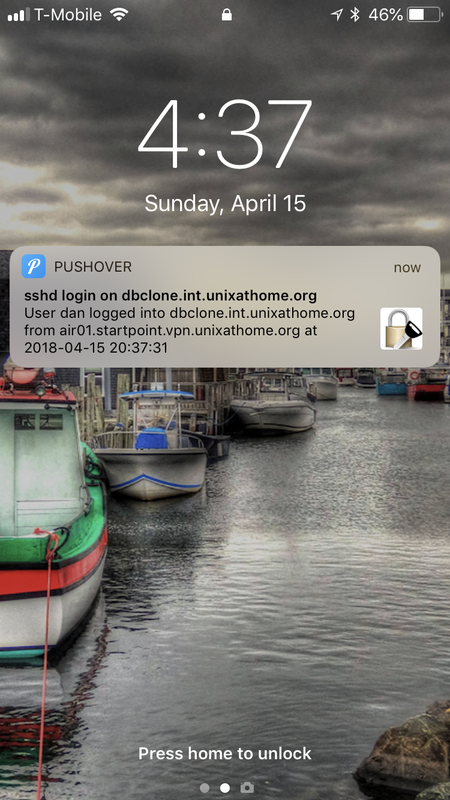 As you read this post, keep in mind that my particular use case of notification on ssh login is not for everyone. It may not appeal to you. In fact, you might find this to be an absolutely ridiculous thing to do. I respect that. I suggest that somewhere within your network there is at least one type of error condition, one urgent situation, one thing that you would like pushed to your cellphone / pager / etc. It might be a failed HDD for example. That is what I ask you to keep in mind as you read this. Think of the possibilities. 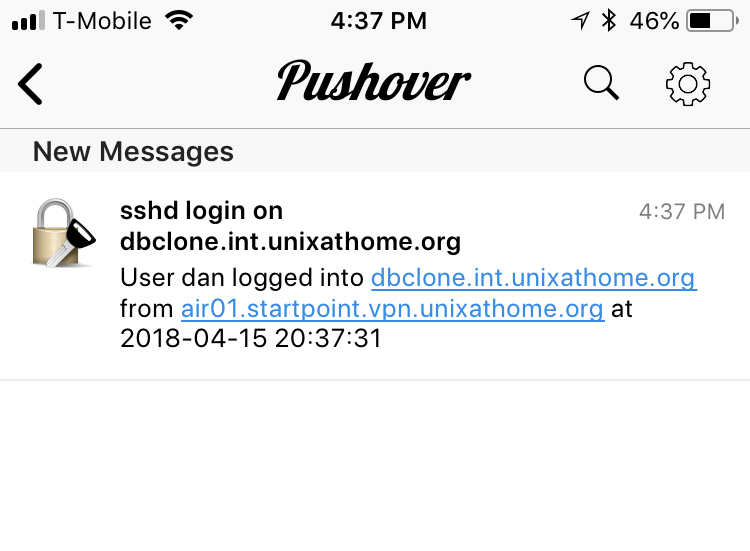 One last proviso: I elected to distribute my notifications via Pushover.net but there are many services which mqttwarn supports. Pick the ones you like. Have a read of the list of plugins, there are at least 38 others to choose fromt. This project started off small. A coworker suggested that we try a login notification system. Each time we logged in, we’d get a notice to our mobile devices. For us, it was an easy solution: add a curl statement to ~/.bash_profile and we would hear about every time our account was used to login. That curl statement would invoke pushover.net and we would get a notice on my watch, cellphone, web browser. If someone logged into our accounts, we’d know. We were using NFS for our home directories on each server, so we just had one file to maintain. Then I started to think if there was another way to do this, other than via shell hooks, something that would also catch scp, etc. I tweeted my idea and goals. Allan Jude suggested PAM. Michael Lucas suggested pam_exec and a shell script. An evil plan was born. I started playing and learning about pam_exec. The next day, I had played with PAM and created something rather short. It worked. It worked well. Excuse me. I’ll be in the corner, sobbing piteously for the future of humanity. Enter Jan-Piet MENS with code. He created a small C program which sends off a UDP packet. This code is invoked via /etc/pam.d/sshd, just like my code was, but that is where the similarity stops. This is where it might sound complex, but it’s not. There are several moving parts, and that’s the way it should be. Small programs, each doing something very well. 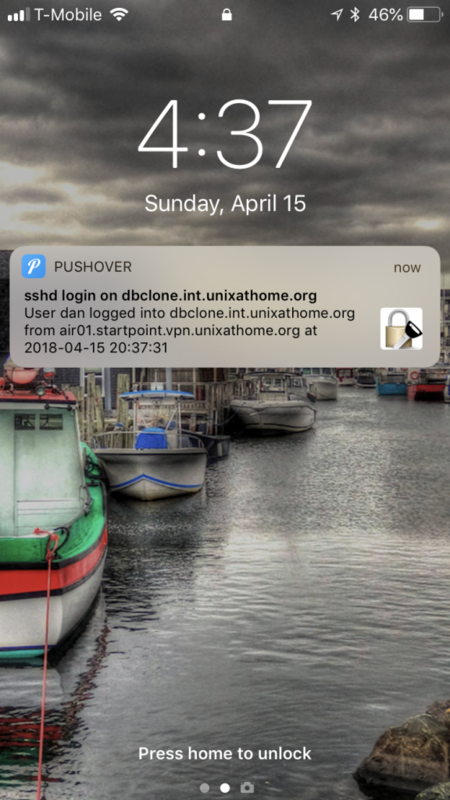 I immediately took a liking to it, mostly because of what I could do with MQTT for other things, not just this login notification obsession. You will notice that is a JSON string. Very flexible. That packet is received by hared, a small Go program. The original was a very short Python program. hared composes a message and deposits it into mqtt. The mqtt implementation I am using is mosquitto. Mosquitto accepts this message and processes it like any other. mqttwarn, a multiple-purpose mqtt-client, accepts that message, and notifies pushover.net. A notification arrives on my cellphone and/or web browser informing me of that login. This is what the notification looks like on my iPhone. This is a cropped screen shot of the Pushover.net application on my iPhone. This is the notification I saw on my Apple Watch. Where do I get this code? hare & hared are on GitHub. I maintain the FreeBSD ports for both hare and hared (written in Go). There is also a python version of hared in FreeBSD but I use the Go version because it has supports TLS. mqttwarn is a GitHub project available as sysutils/py-mqttwarn in the FreeBSD ports tree. It is recommended by the author that mqttwarn be run via supervisord, available as sysutils/py-supervisor in the FreeBSD ports tree. I follow that advice and also run hared via supervisord. In this configuration, I am using just one host. Everything is installed on that host. My home installation differs. At home I have one instance each of hared, mqttwarn, mosquitto and supervisord which services all the servers and jails at home. My servers in other other locations run one instance of hared and one mosquitto (which forwards messages to the mosquitto instance at home). This is very flexible. I do much of the following with an Ansible script, but I’ll show you the manual commands. hared – parses udp packet and tosses it into MQTT. Install on one host in your local network. Mine is at 10.25.0.10 listening on port 8035.
mosquitto – Message broker. Install on one host in your local network. Mine is at 10.25.0.10 listening on port 8883.
udpHost – the IP address which hared should listen on. It should match the address in /etc/pam.d/sshd. mqttURI – the MQTT instance to which hared should send messages. Since I am using TLS, and you should too, I use the FQDN of the host. By convention, mosquitto listens on port 8883 when using TLS. mqttClient – the name used when hared connects to MQTT. It shows up on log entries. It is not used for authorization/authentication. mqttTopic – the MQTT message topic which we will be sending. This will match something in the mqttwarn configuration. 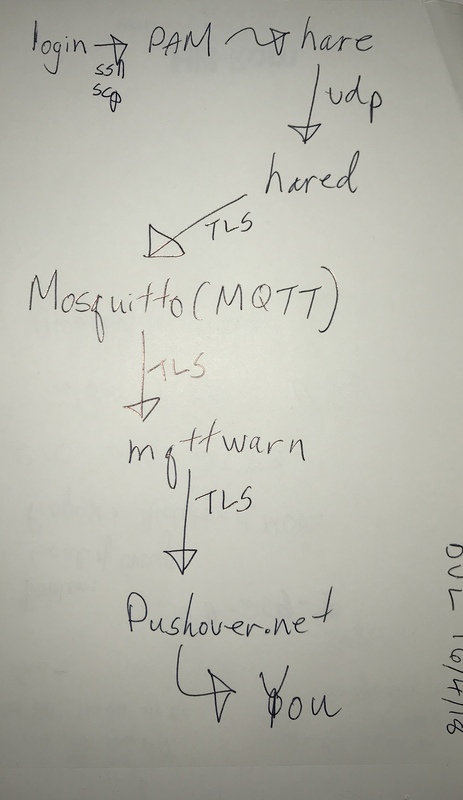 mqttUser & mqttPass – the authentication used to connect to mosquitto. We will use this later when configuring mosquitto using mosquitto_passwd. mqttCAfile – the CA file which hared should used for verifying the certificate presented by the MQTT broker (i.e.mosquitto). Starting hared will be covered under supervisord configuration. The only item worth mentioning: allow_anonymous prevents non-authenticated connections. That is, only clients with valid entries as found in /usr/local/etc/mosquitto/mosquitto.passwd can connect. When adding using mosquitto_passwd be cautious with the -c option: it will overwrite any existing file. Not shown above is other logging, handled by supervisord. tls_version – I use tlsv1 because the other option, sslv3, has known issues. on FreeBSD, but not after 0.10.0.
sshd_log – I also log everything to a file. Yes, this duplicates existing logs on the hosts in question, but I figure, if you can log, you should log. Space is cheap. Time is not. This can be useful when debugging. So I log. userkey1 & appkey1 are obtained from your Pushover.net account. Why supervisord? Supervisor is a client/server system that allows its users to monitor and control a number of processes on UNIX-like operating systems. It is ideal for this situation where the code you want to run does not background itself. supervisord, in it’s current FreeBSD port, expects its configuration file to be at /usr/local/etc/supervisord.conf, but there are a number of configuration files associated with supervisord, I prefer to keep then all in one directory /usr/local/etc/supervisord. childlogdir – this is in the default file, and I still keep it, but read one for where I put child logs. files – other files to include within this configuration. I will explain this later. Great idea from Jan-Piet MENS. These files instruct supervisord how to run each of those daemons. Those programs themselves do not background nicely like most programs do. This is why supervisord is used. You might want to mkir /var/log/hared. The mqttwarn port will create the mqttwarn user. Of note above: MQTTWARNINI and MQTTWARNLOG are environment variables which instruct the configuration and logging files, respectively for mqttwarn. I also create a hared user myself. Perhaps the port should create that user. That’s it. That’s everything. It should work. Is hare installed on the host you are logging into? Is hare configured in /etc/pam.d/sshd on that host? Is the right IP address specified in /etc/pam.d/sshd on that host? Is hared listing on that IP address? Is hared talking to the right MQTT instance? i.e. mosquitto? There are several moving parts. Check the logs, make sure each step is working. That shows the message going into MQTT. The power has gone off. Backups are out of space. I get email notices regarding those issues, but they are urgent enough to be pushed to my phone. I’m sure you can find interesting uses for MQTT apart from login notifications. In a future post, I will describe how I install these tools on remote hosts. I have only one instance of mqttwarn. Each remote host runs its own hared and mosquitto. That instance of mosquitto sends its messages to my main MQTT instance.